Peter and Maree Valusiak get ready for planting. 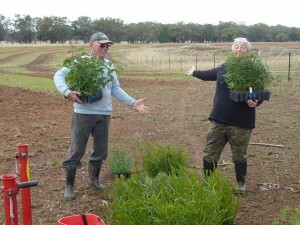 NEW South Wales sheep and cattle producers Peter and Maree Valusiak are determined to do their bit to replace native vegetation removed from their farm at Neilrex, north east of Dubbo. The Valusiaks recently planted a corridor of native trees and shrubs on their property to control wind erosion, build habitat and improve local biodiversity. The Valusiaks were Merino producers up until six months ago, when they decided to concentrate on prime lamb production with first cross mothers under Poll Dorset rams and Dorper-Australian White ewes joined to AW rams. They run a flock of about 300 ewes and lambs as well as 50 beef breeders and 50 heifers on about 422 hectares. The planting project, supported by Central West Local Land Services through funding from the Australian Government and Catchment Action NSW, will provide livestock shelter for five paddocks totalling about 53 hectares. The support included the cost of fencing, site preparation, the supply of seedlings and technical support from Local Land Services staff. It builds on previous work the Valusiaks have done to enhance woodlands on their property. They have taken a long term view on improving their property. Mrs Valusiak said the project links up with an earlier Stoney Creek woodland protection project and will help reduce exposure to winds from the south and south west. “In years gone past a lot of the vegetation was removed, so we are keen to reintroduce trees. “Not just for stock shelter but also to improve our environment,” she said. “Peter and I both firmly believe it is our responsibility to improve our country for the future and not degrade it. The couple worked with Central West Local Land Services staff to plan and implement the work. “We found the staff really supportive and informative. They had a great depth of knowledge and very helpful,” Mrs Valusiak said. The corridor planting builds on 12 months of site preparation by Peter and Maree, according to Local Land Services officer Libby McIntyre. “The Valusiaks have done a great job to prepare their site and will see long term benefits to their production systems and natural resources,” Ms McIntyre said. “Site preparation is necessary for successful revegetation. Kangaroos and hares have been a major issue once the seedlings were planted, highlighting the importance of regular pest animal control to ensure seedling success. 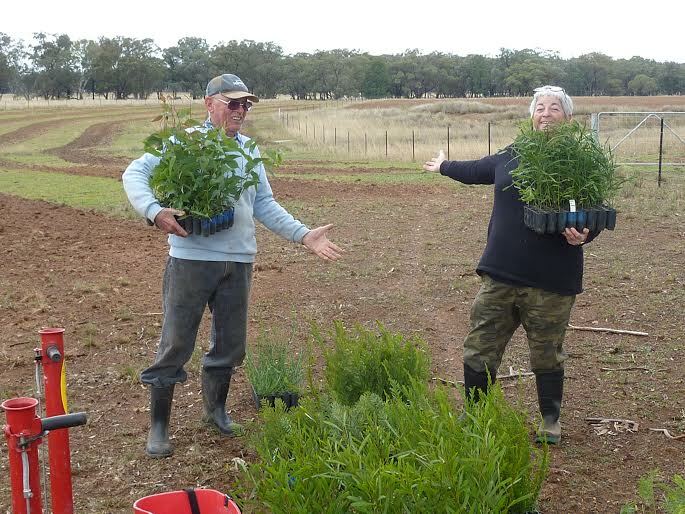 Ms McIntyre said controlling grazing pressure from native and feral animals before and after planting will reduce their impact on delicate new seedlings. Central West Local Land Services is helping farmers like the Valusiaks improve their farming systems, and enhance and protect our natural resources. Source: Central West Local Land Services.